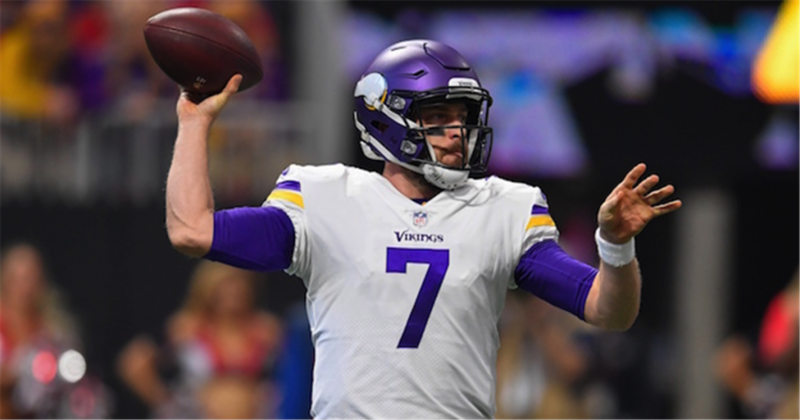 Two teams with serious Super Bowl aspirations showcase their talents when they take to the field on Thursday night as the Minnesota Vikings take on the Los Angeles Rams. This is a battle of two teams that each were playoff teams last season, but it is the Rams who have liked like true contenders so far this season, going undefeated after three games while the Vikings took it on the chin against the Buffalo Bills last week. For three quarters on Sunday, it looked like the Minnesota Vikings had forgotten they were the home team, as they fell behind the Buffalo Bills, giving up 27 unanswered points before falling 27-6. Rookie quarterback Josh Allen led the way with two touchdown runs while throwing for a third as Buffalo headed to halftime leading 27-0. Alan got things started a little less than five minutes into the game when he kept the ball and raced 10 yards for the touchdown. A field goal made it 10-0 before Alan struck again, this time connecting with Jason Croom for a 26-yard touchdown pass. With Buffalo up by 17 entering the second quarter, Alan would score his second touchdown of the game, a 1-yard quarterback keeper that made the lead 24. A field goal made it 27-0 heading into the locker room. Minnesota would finally get on the scoreboard with a little under three minutes left in the game. Quarterback Kirk Cousins found Kyle Rudolph for a 4-yard touchdown pass. The two-point conversion would fail, giving the final of 27-6. Cousins threw 55 passes in the game, completing 40 for 296 yards. Adam Thielen had 14 receptions for 105 yards, but Minnesota would gain just 14 yards on the ground. Despite the loss, Minnesota has the fourth-best passing offense in the NFL, tied with the Los Angeles Rams at 305.7 yards per contest. In total yards, they are ranked 14th (371.7), but are 22nd in points per game at 19.7. On defense, Minnesota is 23rd at 323.3 yards allowed per game and are 16th at 24 points allowed per contest. Jared Goff continues to impress, throwing for 354 yards and three touchdowns as the Rams won the battle of Los Angeles over the Chargers, 35-23. The Rams would take the lead a little over six minutes into the game when Todd Gurley scored from 1 yard out. The Chargers would pull within one, but a Goff passed to Robert Woods went for 3 yards and a touchdown to extend the lead to eight. A blocked punt was then recovered by Blake Countess for a touchdown to give the Rams a 21-6 lead. The Chargers would pull within eight just before the half, but the Rams would score 2 third-quarter touchdowns to take charge of the game. Goff found Cooper Kupp for a 53-yard strike a little over two minutes into the third quarter and would add a 6-yard touchdown pass to Woods to make it 35-20. The Chargers would add a late field goal but would get no closer than 12. Goff finished 29 for 36 for 354 yards. Gurley ran for 105 yards on 23 carries, and Woods had 10 receptions for 104 yards and two touchdowns. The Rams offense has been impressive this season, ranked third in the NFL at 439.3 yards per contest. They are also third in points per game at 34. The defense is sixth in the NFL, allowing 296.0 yards per contest and they are number one in points allowed a 12.0. 8-3 ATS in their last 11 games in September. 43-21 ATS in their last 64 games overall. 1-4 ATS in their last five games against NFC opponents. 0-4 ATS in their last four games against teams with a winning record. 6-2 ATS in their last eight games in September. 1-4 ATS in their last five Thursday night games. 2-6-1 ATS in their last nine games at home when facing a team with a losing record on the road. While the Vikings loss was a shocker on Sunday, no one should expect that kind of performance on Thursday night. That was more of an anomaly than anything else, but Minnesota is still not better than Los Angeles, especially in a short week. This is a battle of two hot quarterbacks, with the Rams having the better defense. Expect Los Angeles to win, but likely by not more than four points. Because of how effective these two offenses are, it makes sense to go with the over here. This is likely to be a 52 point total, ending something like 28-24.